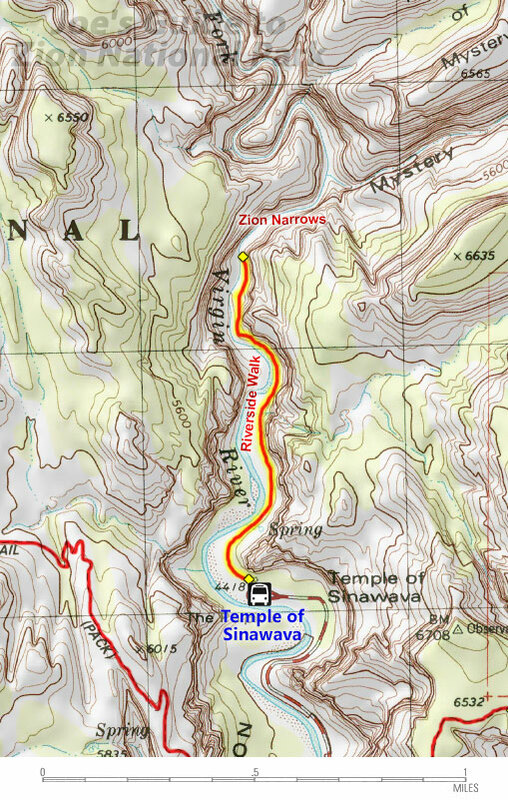 Starting at the Temple of Sinawava (the final shuttle stop deep in the heart of Zion Canyon), the Riverside Walk is a wonderful little hike on a fairly level paved trail that affords great views of the Virgin River and wonderfully lush hanging gardens and trees surrounded by tall weeping walls. This hike is very family friendly -- young children and the elderly alike can do this hike as a leisurely stroll, and the trail is also wheelchair accessible. This mostly level hike is roughly 2-miles long (round trip) and may take 1-2 hours to complete (or more if you want to take your time and soak in the views). Rating: Easy family stroll; good for children and wheelchair accessible. 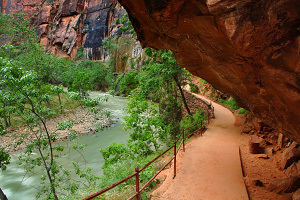 1) This trail used to be known as "Gateway to the Narrows," but it was changed to "Riverside Walk" in the 90's to make it sound more hip and family-friendly! 2) You are likely to see quite a bit of wildlife on this trail, especially at dusk -- from mule deer to wild turkeys and not-so-wild squirrels. As tempting as it is, please do not feed the wildlife, even those aggressive squirrels who always put on their cute faces for tourists! 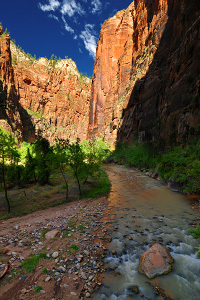 Put this hike on your "to do" list; it's wonderful and it's not strenuous! This little trail is a personal favorite of mine, especially in the late afternoon or early evening when this part of the canyon is out of direct sunlight. It's the perfect spot for a relaxing or romantic walk with your significant other.